My special Cycle Oregon page is not up! Wow, what a ride! While not as scenic as CO2009, where we climbed 4 mountain passes, it's hard to beat the Oregon Coast. Day 1 was short while Day 2 was long and actually pretty difficult. Days 2-5 were very scenic while Day 6 was a leg-burner. Day 7 was a nice wrap-up through areas around Roseburg where I lived during my High School days. In terms of effort I was surprised at the level of effort required on days that I thought would be quite easy. As of October 1st all pictures from the ride are on my Flickr website. No mechanical issues! No flats, no broken spokes, nothing! Can't ask for anything more in that category. No health issues or injuries. Great scenery: wonderful views of rural Oregon, the Oregon coast, and coastal mountain ranges. Great people: can't say enough about the fun, friendly riders and volunteers on this ride. They continue to be one of the best parts of the trip. Wonderful weather - only had 1 morning on the coast that was cool with heavy mist (i.e. not quite rain). The rest of the time was warm and sunny, which is unusual for the coast. Lack of training - Just as in CO2009 I did not train nearly enough: not enough miles and not enough seat-time. Will I ever learn my lesson? My Camera - once again my Sony DSC-S730 camera has fallen below my performance expectations. I plan to make a purchase before my next major tour/ride/campout to avoid these issues. Several key shots that I wanted did not come out as expected. Shoe issues - I need new in-soles in my bike shoes. The current ones did not provide enough cushioning on the vast amounts of chip-seal we experienced. I am now Cycle Oregon +15 days and recovery is now complete, even though my bag is still not 100% unpacked. I was hobbling around only for 1 day with most soreness completely gone by day 3. On the Friday after returning I took a ride into Seattle for a work event(aka the annual stress test of the cell towers around Safeco Field) and ended up doing just about 50 miles. Wow, my legs were rebelling. If they could speak they would be saying, "I thought we were done with this?" Will I be doing Cycle Oregon in the future? Absolutely, but perhaps not next year. Taking 8 days away from my family is a hard sell initially and then hard on everyone involved (i.e. my wife). "Seed of a clue: That hill we climbed yesterday was too short. One day next year we are going to climb higher, longer, without backtracking, than we ever have." 2012 will be the 25th anniversary of the Cycle Oregon week ride. I'm sure they have an EPIC ride planned. I'm just not sure my family is ready for me to do it again. Posted in Cycle Oregon, Cycling, Race Reports and tagged with Cycle Oregon, bike touring, cycling. September 25, 2011 by Lee Donnahoo. Cycle Oregon Countdown: 2 Days To Go! Packed and ready!2 days to go until Cycle Oregon 2011! What did I just type? 2 days left? AAHHH!! Panic time! Well, not quite but time is very short. This is where I will probably spend the least amount of time sleeping. Why won't that be tomorrow night? Well, because tonight is my last night at home before I drive down to Sutherlin, Oregon and begin my adventure. That's right, Cycle Oregon Day 0 starts tomorrow at approximately 10 am. Tonight I will spend several hours laying awake in bed running through my packing list and memories of the 2009 ride thinking about all the things I may have forgotten. How many times will I get out of bed to check my bag to make sure _____ (fill in the blank) is still in the bag? My prediction is 2. Any odds on 3 or more? The entire drive from Sammamish, Washington to Sutherlin, Oregon is about 357 miles which I should be able to cover in just about 6 hours. Leaving at 10 am will put me there around 4 pm, assuming I don't stop to do any shopping along the way, which I most likely will do. NormalGuyTri.com(i.e. this website) - You can do the direct link or use the RSS feed. If you are reading this then you know where to find me. I will be posting regular updates, possibly every day but at least 2-3 times during the week. After the ride I will post a full-write up. But first I will need have some time to sort through all the pictures and collect my thoughts. Facebook - You can Like me on Facebook or even read the RSS feed. I will be sending out brief updates throughout the week, most likely several times a day. Twitter: @normalguytri - This will be almost a full duplication of what's on Facebook since the two are linked. Flickr - I will periodically be posting pictures taken from my phone on a Flickr Set I created for this ride. Google+ - Just look for Lee Donnahoo on Google+. Not sure I will update it much but maybe I'll post there a couple of times. Of course all this assumes that I have the right cord for my phone to recharge it along the way. Or maybe I'll use the Blogmobile. I considered buying a Spot or the Garmin GTU 10 to automatically broadcast my location but I couldn't justify the cost. The ability to have a website with your current coordinates is very attractive, especially with the Spot where you don't need cell service to use it, but with a ride like Cycle Oregon they have you covered in emergencies. For future hikes or unsupported rides it may help to ease some minds (i.e. my wife's) but that decision will not be made today. Posted in Cycle Oregon, Cycling and tagged with Cycle Oregon, bike touring, cycling. September 9, 2011 by Lee Donnahoo. For those who don't know, Cycle Oregon, or just CO for short, is one of the best supported touring rides in America, spanning 7 days and upwards of 450-500 miles of some of the best mountains, valleys, and countryside in one of the most beautiful states in the US. OK, I'm partial to it because I spent 10 years of my life living in various cities in this great state. Even 20 years later I find myself drawn back again and again to visit family and vacation in places that remind me of my home long ago. I wasn't there so this is a quote/paraphrase posted in the CO2010 forum. Over the coming weeks there were riddles and other hints about "heavenly" and "powers that be" as well as a statement that the overnight stops would be cities that have never host an overnight stop before, which eliminates a lots of cities. One night last month I was up late and decided to figure out where Jonathan could be referring. After some rudamentary statistical analysis I figured that the coast, central, and south-eastern areas of Oregon were ripe for the picking. "We think the southern Willamette Valley, the central coast range, south central coast and possibly the Roseburg area. Possible overnight spots are Philomath, Junction City, Waldport, Mapleton, Reedsport, Coquille, and Winston.... There is also the Powers to Glendale Bike Route." Speculation and rumors were running high! OK, maybe they weren't actually but I was getting really excited. I didn't care what they were to announce, I was signing up! Going Coastal! 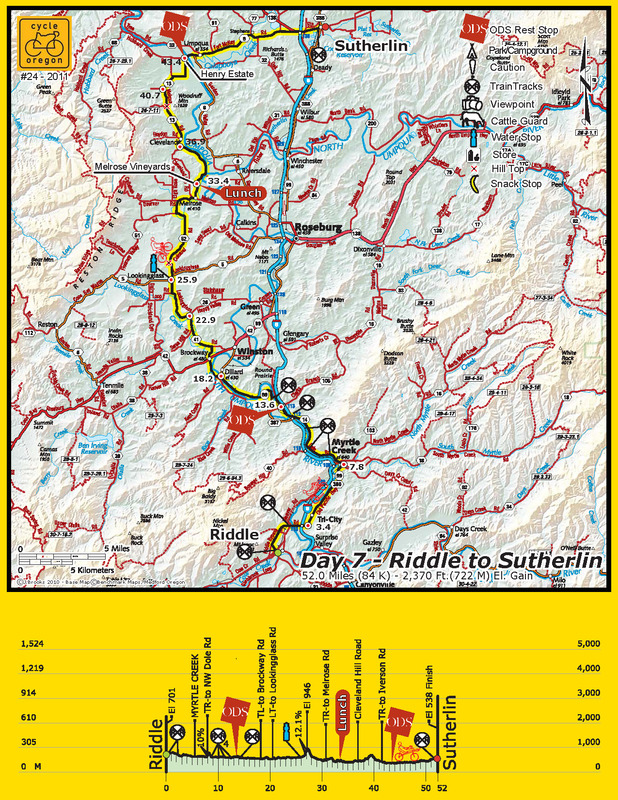 The route is to start in Sutherlin, just south of Oregon, meander out to the coastal towns of Reedsport, Coos Bay, and Bandon, and then loop back east to Powers, Riddle, returning to Sutherlin on day 7. This, like the route in 2009, was going through areas where I lived during my High School years in Roseburg, Oregon. Even though the ride difficulty and climbing elevation are not that high the scenery and experience will be well worth it. My own "debate," if you can call it that, lasted all of 24 hours. I wrestled with the decision only because of the cost and week-long commitment of vacation time. I'm glad I didn't wait too long because the ride sold out in 36 hours. I hear their popular "tent and porter service," where they provide you a tent, set it up at each city, and move your luggage for you, sold out in a couple of hours. Now the fun begins: training, training, training, and begging. Begging? Yes, begging. Begging friends, family, and anyone else I know to go with me. In '09 I did the ride essentially by myself. Yes, I made some friends and met up with some co-workers along the way, but I went there alone knowing nobody. One of my uncles originally agreed to do the ride with me but other priorities got in the way. This year one of my sisters was in the same position but, once again, the stars just didn't align. Several friends from work are either registered or on the waiting list so hopefully I'll know someone going in this time. Maybe I can convince my wife to volunteer, who knows?